Premier Daniel Andrews said the environmental risks posed by the practice, whereby liquids are blasted into rocks to force existing fissures open and enable the extraction of coal seam gas, exceeded any benefits derived from it. "Our farmers produce some of the world's cleanest and freshest food. 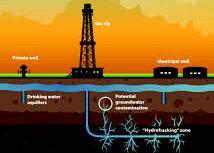 We won't put that at risk with fracking," Andrews said. "This is the first ban of its kind anywhere in our nation. And it just speaks volumes to the dangers, the uncertainty and the anxiety within the Victorian community about fracking -- we just don't think those risks are worth taking," he added. Fracking has been found to contaminate nearby water supplies, pollute the air and even cause earth tremors, according to seismologists in the United States. A Victorian parliamentary inquiry into the issue in 2015 received more than 1,600 submissions, most of them opposing the practice. "There has been a great deal of community concern and anxiety about onshore unconventional gas -- this decision gets the balance right," Minister for Resources, Wade Noonan, said on Tuesday. "We have carefully considered the Parliamentary Inquiry's key findings and recommendations, consulted widely and made our decision on the best available evidence." Included in the legislation that will permanently ban fracking in Victoria is the proposed extension of a moratorium on conventional gas mining to 2020, a proposal the Australian Workers' Union (AWU) said would cost Victoria jobs. "If new exploration and extraction is not allowed, there will be an exodus of investment and jobs from Victoria," AWU Victorian secretary Ben Davis told the ABC.